Have you ever seen an old man with the body of a youth who has a lion for a pet? 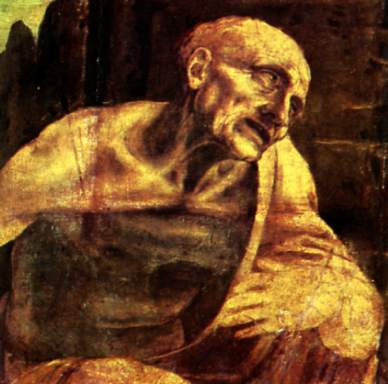 Look no further than Leonardo’s St Jerome. The painting is obviously unfinished but it exudes a powerful presence despite, or perhaps because of, the sketchy appearance. This work forces the viewer to use their imagination to complete the narrative and drama promised by the picture. Leonardo’s treatment of Jerome’s years in the wilderness depicts the saint, clean shaven and down on one knee. His traditional attribute, the lion, fills the foreground of the picture. A muscular arm holds a rock in readiness for penance as the saint beats his own breast. The head is similar to Leonardo’s anatomical studies of the head and neck of an old man and is quite skeletal in its appearance. Jerome’s gaze is drawn towards a crucifix which is sketched on the upper right of the picture (this is quite difficult to see). 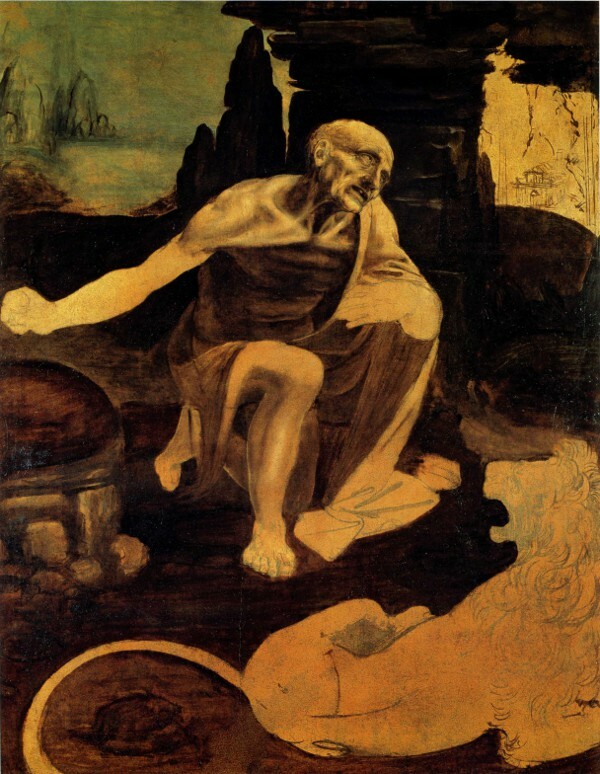 The landscape is typical Leonardo, as is the unfinished figure of the Saint who is portrayed as an ascetic, living his life in the desert or countryside and devoting his life to god. Jerome spent the last thirty-four years of his life living in a hermit's cell near Bethlehem. His translation of the Old Testament from the original Hebrew is one of his greatest works and resulted in his canonisation by the Catholic Church. The attribution to Leonardo is not in doubt. However very little is known of the whereabouts of the painting during the centuries. At some stage the head was cut out but later rediscovered, the completely restored work was then placed in the Vatican gallery. Also, the date of the picture, once thought to be 1481/82, has now been revised as possibly 1488/90 at a time when Leonardo was in the service of the court in Milan. The type of wood used for the painting is walnut, a support used by Leonardo after he left Florence for Milan in 1482. All of his work in Florence was painted on poplar wood supporting the Milan date for the work. I was privileged to see the St Jerome in January 2012 at the Leonardo exhibition at the National Gallery in London. For me, as mentioned above, the picture certainly carries a powerful aura, quite a different feeling to a reproduction in a book, to view first-hand da Vinci’s construction of a work is magical.